Names: Mostly just Starzie or Starz on the net. My real name is Ashley, and i guess I don\'t mind you using it if you so choose to. Age: 23. I\'m a Pisces, and was born in the Year of Tiger. Rawr. 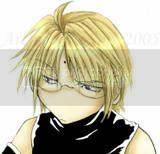 Current Interests: SAIYUKI~! XD *glomps Sanzo and Hakkai(after stealing the gun and fan away)* And D.Grey-Man (KANDA! *fangirls*) and Loveless. Just bought the entire collection for Loveless and love it to pieces~!